Our familiarization trip has in his core to express our support for the incredible development of tourism in Zimbabwe under the care and benevolent support of H.E President Robert Mugabe, the celebrated African hero and with the efficient and lofty supervision of Minister Walter Mzembi and Tourism authority of Zimbabwe chairman- Karikoga Kaseke declared H.E. President Anton Caragea. Our fact finding tourism mission must also mark the start of rebuilding European-Zimbabwe relations, the end of the futile and unnecessary sanctions and to mark the fact that tourism in Zimbabwe is the perfect, safe, luxury and ideal vacation spot for all the world tourists. After our visit and after receiving the world highest tourism honor the tourism in Zimbabwe has become world recognized, perfect placed in the world spotlight and all the tourism agency has already started or will soon start to include in their travel program the perfect scenic destination of Zimbabwe. We succeded in ending the separation between tourism community and in a few years Zimbabwe, if continues the policy of President Robert Mugabe and Academician Walter Mzembi will surpass all the tourism competitors in the region. The days of betterment and perfect development of tourism in Zimbabwe are right ahead concluded European Council on Tourism and Trade`s President his report over his visit to Zimbabwe-the gem of Africa- WORLD BEST TOURIST DESTINATION IN 2014. 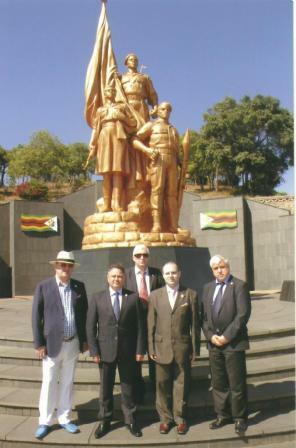 The European Council on Tourism and Trade high level delegation has toured Zimbabwe-WORLD BEST TOURIST DESTINATION IN 2014 in order to express the European support for the development of tourism industry in Zimbabwe and clearly mark the fact that Zimbabwe has developed into the epitome of high class tourism in Africa. H.E. President Robert Gabriel Mugabe-a true African hero and President Professor Dr. Anton Caragea. 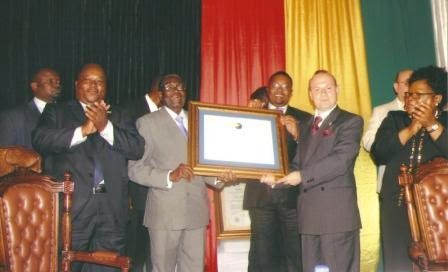 President Robert Gabriel Mugabe and Professor Dr. Anton Caragea leading WORLD BEST TOURIST DESTINATION AWARD ceremony. Victoria Water Fall observed from helicopter (3.000 meters). President Professor Dr. Anton Caragea gives an interview to Zimbabwe National Television. H.E. President of the Republic of Zimbabwe-Robert Gabriel Mugabe, the african liberation lofty personality, has presented the official acceptance speech on behalf of people and government of Zimbabwe for the WORLD BEST TOURIST DESTINATION AND FAVORITE CULTURAL DESTINATION awards for the country.